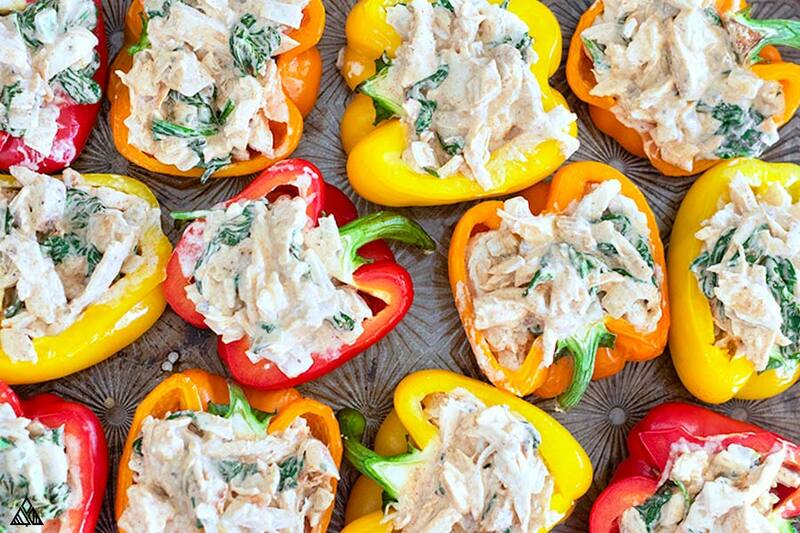 Chicken Stuffed Peppers - So Healthy + SO Delish! Oh dear, these chicken stuffed peppers are gooooooood. So good, I almost couldn’t write this article because I was too busy enjoying every last nibble. So good, we didn’t have leftovers. So good, I’m making it tomorrow for dinner, again. So good, my picky-eating-friends cleared their plates. If you’re ready to make chicken stuffed peppers that’re really that delicious, then let’s get roasting! I adapted this recipe from my Mom’s stuffed pepper recipe, and left out the high carb foods like corn and beans. 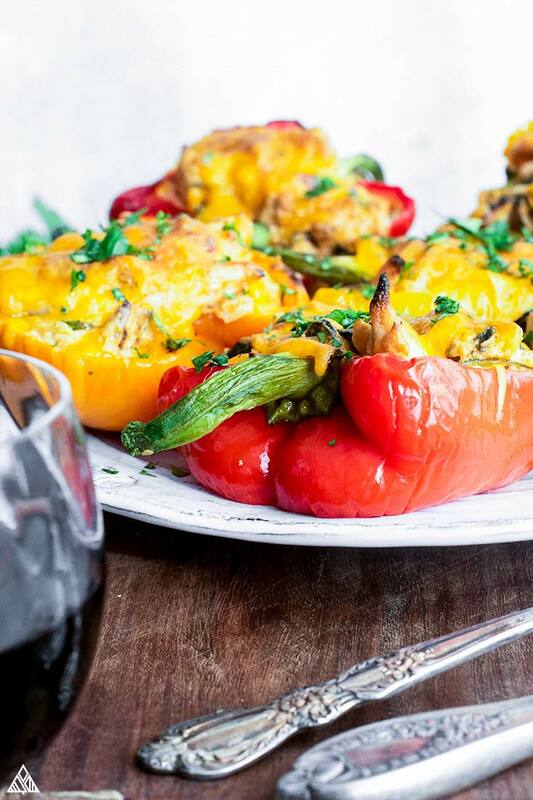 Trust me friends, you certainly wont miss those ingredients in these chicken stuffed peppers! Ok, so now that we’ve establish how DELICIOUS these stuffed peppers are, let’s talk about how to make them. If I were to rate the amount of effort these chicken stuffed peppers require to make, I’d give ‘em a 4 out of 10: they’re SUUUPER easy to throw together, but still require a bit of time (cooking the chicken, sauteing the veggies, etc.). But don’t worry, it’s worth it! Prep your peppers + chicken. Before filling the stuffed peppers with chicken and cheese, let’s soften the peppers — skipping this step will give your chicken stuffed peppers an unwelcome crunch. To do this, cut the keto vegetables in half and de-seed them. Then, lay them flat on a baking sheet and spray both sides with cooking oil. Bake in the oven for 25 minutes, or until they’ve softened and begin to slightly brown. To kill two birds with one stone, let’s bake out chicken at the same time! This can easily be done by baking the chicken on a rimmed baking sheet alongside the peppers. Sprinkle each chicken breast with oil, salt and pepper first, of course. Alternatively, you can save some time by purchasing precooked chicken and shredding it before adding it into the chicken stuffed peppers. 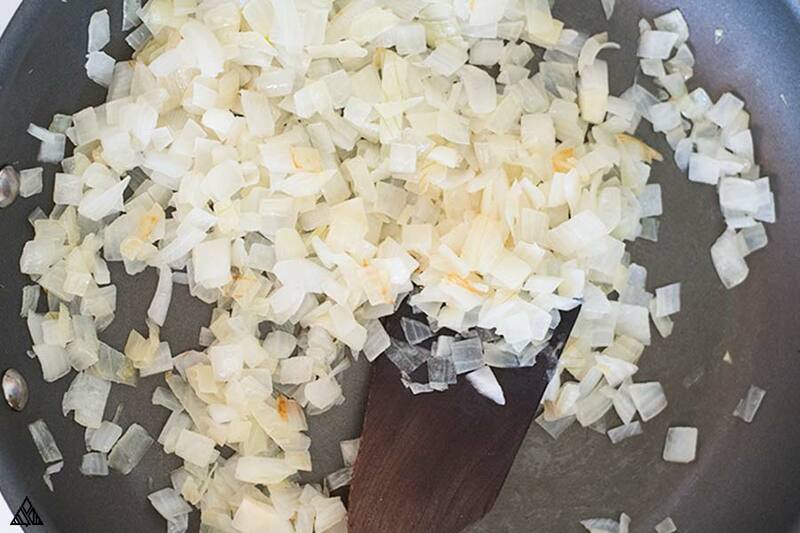 Meanwhile, let’s sauté the low carb vegetables — starting with the diced onion (this takes the longest to cook). Cook until it’s translucent and caramelized, about 10 to 12 minutes. Then add the spinach and garlic — we want to cook as much of the liquid out of the spinach as possible, no one wants soggy chicken stuffed peppers! Now for the home stretch: Mix the ingredients for the sauce in a small bowl (this will help to ensure the spices dissolve into the liquid and blend evenly throughout our chicken stuffed peppers). Then pour the sauce over the filling and mix it all together. Spoon the filling into each of the baked peppers. Then top them with shredded cheese and bake in the oven until the cheese melts and everything is heated through — should be about 10 minutes. 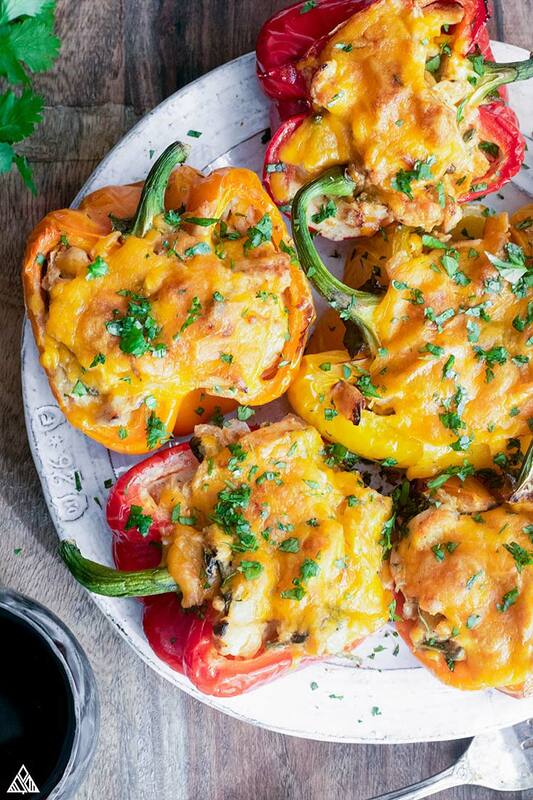 Pst, if you’d like to make these chicken stuffed peppers healthy – ier, you can use less the cheese or leave it out altogether! 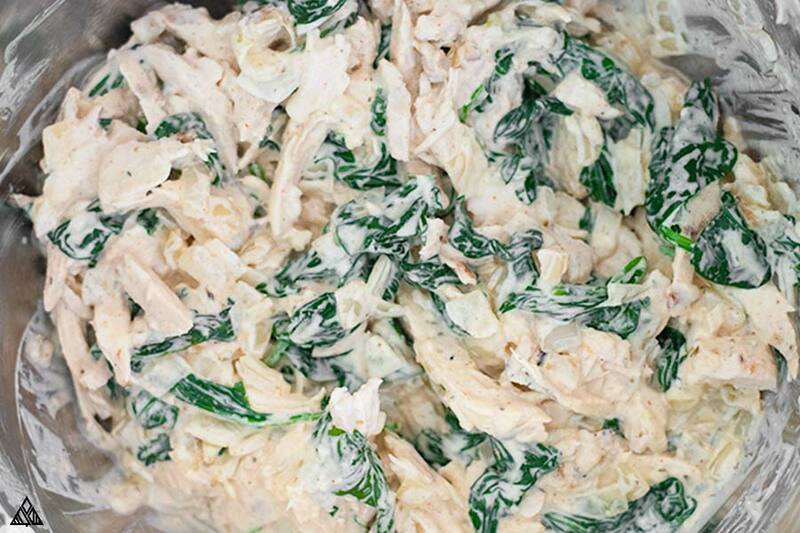 Or, you could go the opposite direction and stir some cream cheese into the mix. Chicken stuffed peppers cream cheese anyone? 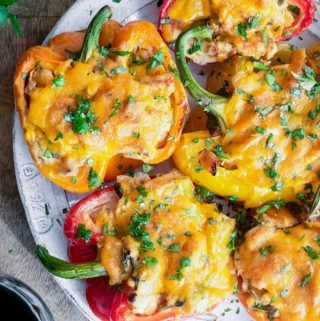 These low carb stuffed peppers are ridiculously delicious on their own, in all their cheesy glory. It’s one of those complete low carb meals — veggies, protein, and a tasty sauce. Parmesan crisps, everything’s better with crunchy cheese! 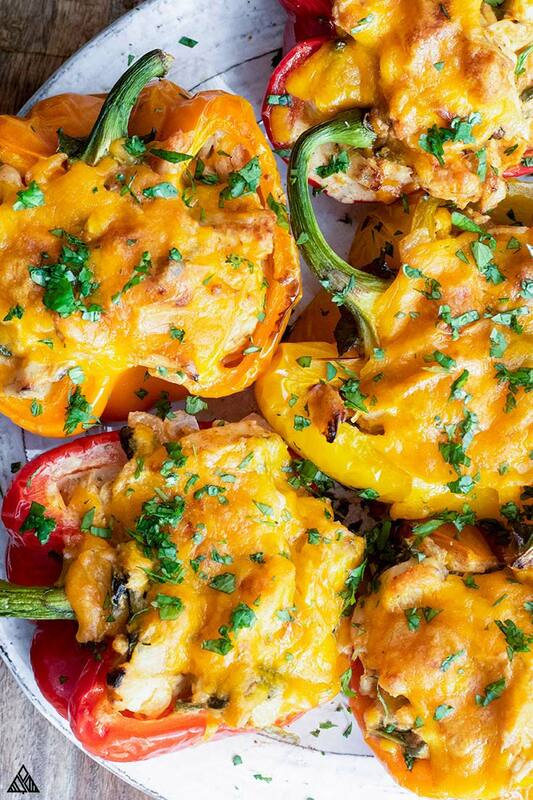 Psst – These chicken stuffed peppers have a whole lotta flavor! 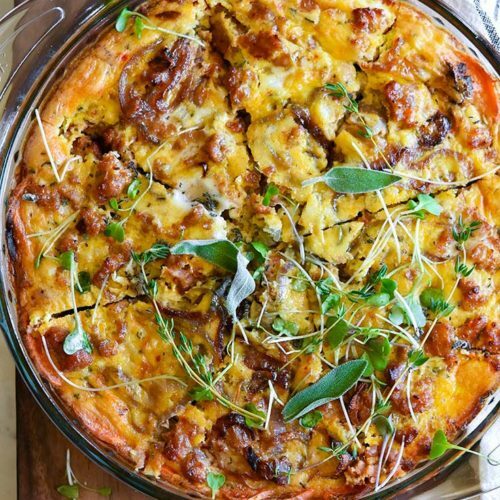 So, to keep this recipe the star of your low carb dinners, I keep the keto side dishes simple. You guys know I’m all about my low carb meal prep! 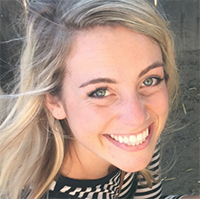 I find it’s the easiest way to stay on track during busy (or lazy) workweeks. And these keto stuffed peppers are the perfect recipe for the job — they make for great low carb lunch ideas and dinners. When meal prepping these chicken stuffed peppers, I assemble the entire recipe, but only melt the cheese on the peppers we’ll eat at that meal. 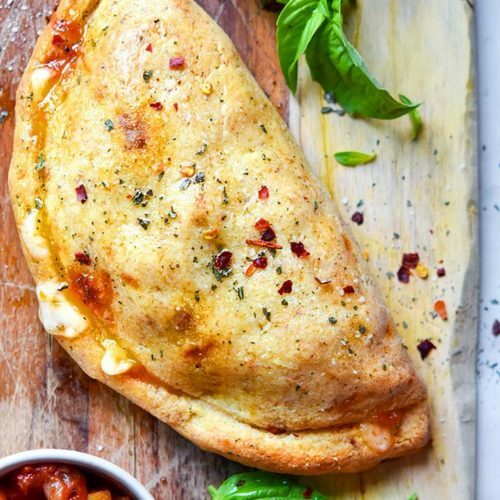 Throughout the week, whenever I’m craving this dish, I sprinkle it with cheese and pop it in the oven. 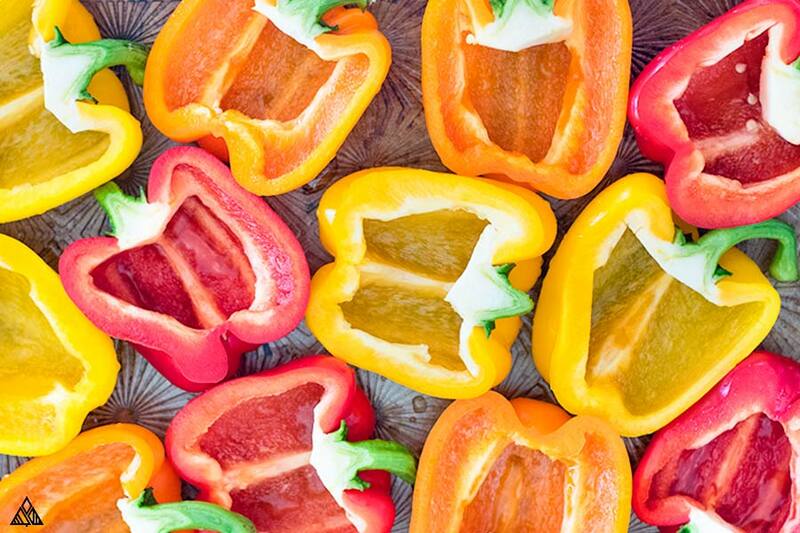 Portion peppers into your best meal prep containers — be sure to keep the toppings and chicken stuffed peppers separate, so the toppings don’t lose their crunch during the reheating process. 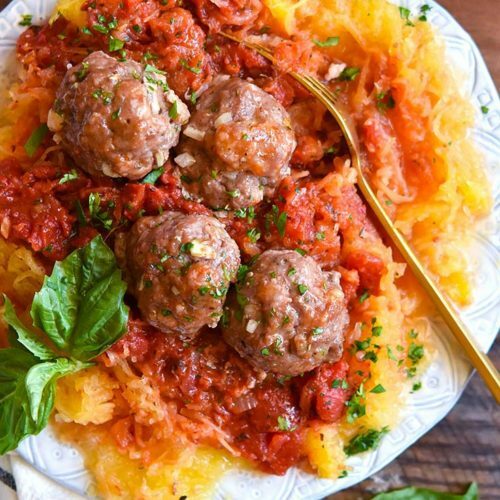 Psst — If you’re meal prepping this recipe, make a double batch! Same amount of work for twice the keto meals. Can You Freeze Stuffed Peppers Without Rice? Freezing your stuffed peppers without rice is a great way to meal prep for future meals — although of all the recipes I freeze, chicken stuffed peppers seem to have a lot of ice buildup. I suggest defrosting them in the oven on a rimmed baking sheet, and plan to drain a little water from them (sounds weird, but we didn’t find the flavor to be affected). Let’s dooo thisss! Can’t wait to hear whatcha think of these chicken stuffed peppers! Let me know what toppings you enjoyed most in the comments below. 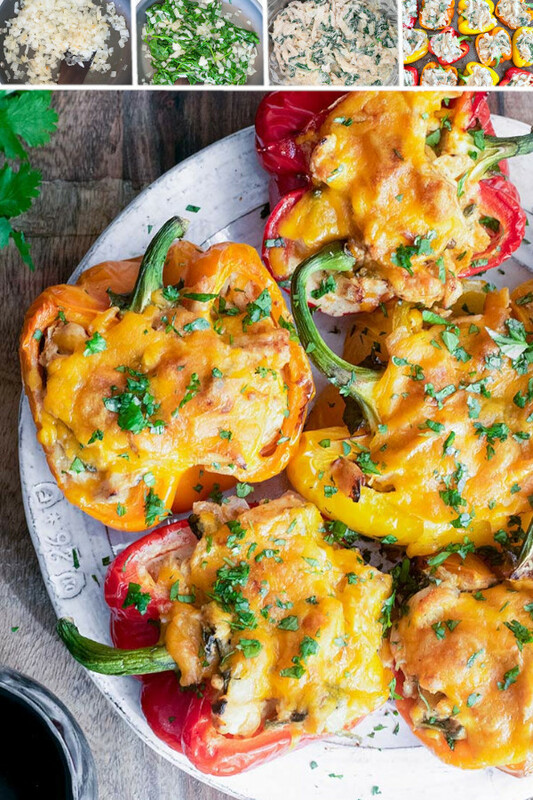 Healthy, easy and cheesy keto chicken stuffed peppers are the ultimate low carb dinner! Full of sassiness and delicious flavor! Cut bell peppers in half and de-seed. Place peppers on a baking sheet and spray each side with cooking oil. Place chicken on a 2nd rimmed baking sheet. Rub chicken with 1 tablespoon of oil, and sprinkle with salt and pepper. Place both baking sheets in the oven, and bake for 25 minutes. Meanwhile, add 1 tablespoon of oil to a large nonstick pan. Once shimmering, add the onion and saute until translucent (about 10 minutes). 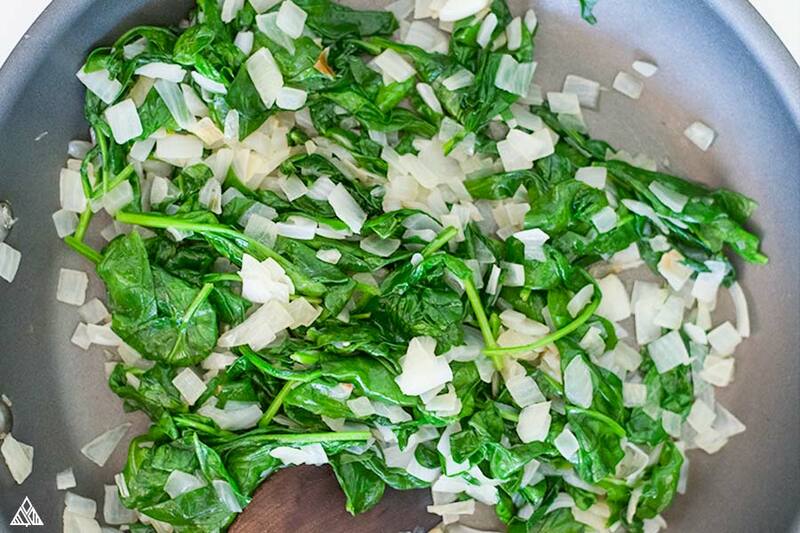 Add the garlic and spinach, and cook until spinach has released its liquid and fully wilts. Remove both baking sheets from the oven -- you'll know the bell peppers are done when they've softened, and the chicken is done once it's no longer pink in the center. Add cooked veggies and shredded chicken to a large bowl. In a small bowl, combine remaining 1 tablespoon of oil, lime juice, sour cream, chipotle peppers, oregano, cumin, chili powder, salt and pepper. Pour the ingredients from the small bowl over the chicken and veggies and stir to combine. Spoon the filling into the bell peppers. Bake in the oven for 10 minutes, or until the cheese has melted. Serve with cilantro and enjoy! Nutrition information is based on 1 of the 6 bell peppers halves. In the photo it looks like you added sour cream or cream cheese to the chicken mixture before you filled your peppers. Did you happen to leave out an ingredient in your recipe? I can’t wait to try it. It looks really yummy.